On weekends I wake up much earlier than necessary, stumbling from my bed to the bathroom, right to the stove to start the kettle. While the world is still sleeping I stand there, waiting, and staring blankly at the kettle of which I see two in my bleary-eyed stupor. It’s warm in my room; I run a space heater, even in April, to make up for bad windows that let in cold wind. The heatless kitchen seems cold in comparison and I stand pulling and clutching at the ripped arms of my shirt. I’m constantly fixing for heat, no matter the season, and I have an easy way to satisfy this itch: boiling water. Suddenly I’m shocked out of my trance with a whistle, and I return to my warm room with my warm tea. I carefully lie down on my side a while in my warm bed, clutching and sipping and thinking my morning thoughts, reflecting on my dreams and, most recently, nightmares of the evening’s rest. And with the last tepid sip, I am warm and clear and ready. This week, it was back to work in my small city, which has felt even smaller as of late. Back to normal, I guess. Normal? Whatever that means. I only broke down in public once on Monday. Not bad. It’s been a time when we’ve all needed warmth and comfort, and I still do, unsatisfied with the way things ended, with the media that runs our lives, and with some of the reactions I’ve seen. And I’ve never felt so cold — so in need of that tea that keeps me going on the bright days too. I drink my tea hot. Damn hot. A slip past my lips, a slithering roll down my tongue, and it rushes down to the gut, burning it and setting it aflame. It’s still hot when it hits the belly. It’s so hot I can feel it in my chest, between my breasts, in my heart — I can feel. So I’ve been drinking tea and eating this cake (and too little else to be honest) lately. Well, I’ve also been eating tea and drinking cake, because this is an earl grey chocolate cake. My favorite caffeinated tea (I rarely drink caffeinated tea) — earthy, a little musty, with a bright citrus squeeze of one-of-a-kind bergamot — meets rich, sharp dark chocolate. It’s not a new combination, but when I bit into a small square of an earl grey dark chocolate I bought several months ago, I knew it needed to be a cake. A Bundt cake. 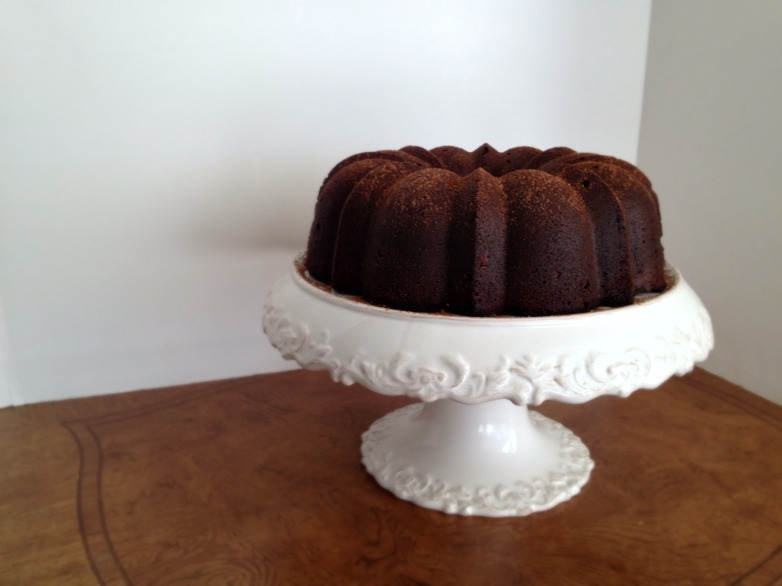 Because what cake goes better with tea than a Bundt? 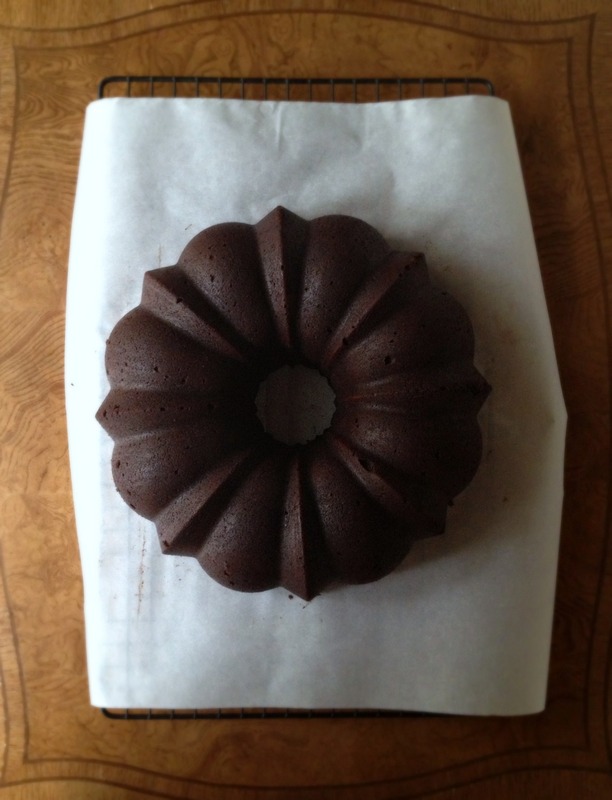 Well, it turns out that an earl grey chocolate Bundt already exists out there. But with 6 measly tea bags, minimally brewed, and a small amount of unsweetened chocolate, I knew it wouldn’t be like my square of chocolate. I wanted something deeper, smoother, and richer, without being heavy. 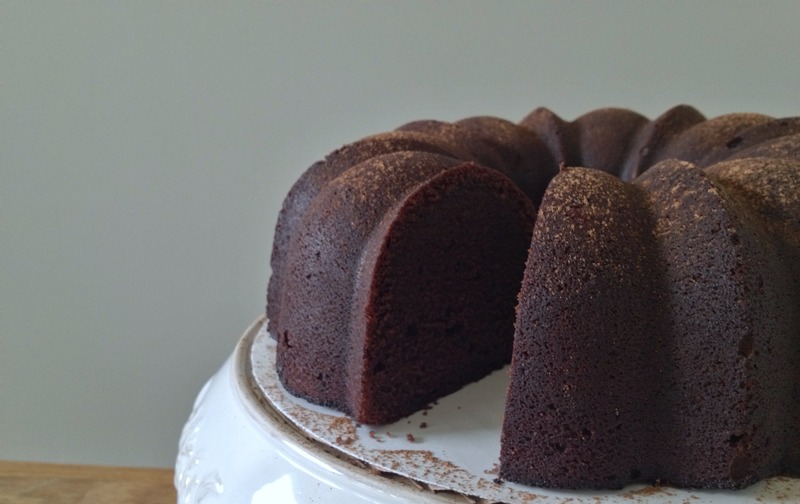 The solution was simple: I used an already winning chocolate Bundt that I love Love LOVE (seriously, it’s ridiculously rich and a great option on its own for chocoholics) and tweaked it to accommodate the tea. Though I toyed with the idea of toning down that deep chocolate flavor that made me fall hard for this recipe, I thought better of it after testing it that way. This cake recipe below is no less chocolaty than the original but the earl grey comes through, mingling with what seems like its meant-to-be bed partner. And its heat helped me sleep. Even through these times. This cake is dense and tight-crumbed like a pound cake, but moist like the best chocolate cakes. It is imperative to use natural cocoa for this recipe, as the cake calls for baking soda and sour cream. If you need to use dutch-processed cocoa, you could try swapping sour cream for milk and playing with baking powder accordingly, but I have not tested this and it will most definitely compromise the cake’s soft, velvety crumb. Measure water after, not before, boiling. Here, the chocolate flavor is powerful and the tea provides a strong back note. If you would prefer a more subtle tea flavor, you can reduce the brewing time and cut down the amount of tea to suit your tastes. Adjust oven rack to middle position and heat oven to 350 degrees. Stir 1 tablespoon melted butter and 1 tablespoon cocoa powder together until smooth. Brush 12-cup Bundt pan with butter-cocoa mixture, being careful to cover the entire pan and tube and get into crevices. Fill small saucepan with water to 1 inch and bring to simmer over low heat. Combine remaining 3/4 cup cocoa and finely chopped chocolate in medium heatproof bowl; set aside. Place tea leaves in liquid measuring cup. Bring kettle of water to boil. Once boiling, immediately pour 230 grams (1 cup) water over tea and cover so no steam escapes. Let tea sit for 6 minutes. Uncover measuring cup and immediately pour 172 grams (3/4 cup) tea through fine-mesh strainer over cocoa-chocolate mixture (you will most likely need to press on solids in strainer to release enough liquid to get 3/4 cup; about 1/4 cup gets absorbed by the tea), whisking thoroughly to melt and combine (if any pieces of chocolate stubbornly refuse to melt, place bowl on top of saucepan and whisk mixture briefly to melt completely). Let chocolate mixture cool, about 10 minutes. Whisk in sour cream until combined; set aside. Whisk flour, salt, and baking soda together in medium bowl. Using stand mixer fitted with paddle, beat butter, sugar, and vanilla on medium-high speed, scraping down bowl occasionally, until light and fluffy, 3 to 4 minutes. Add eggs, one at a time, mixing for 30 seconds and scraping down bowl after each addition. Add flour mixture in 3 additions, alternating with chocolate mixture in 2 additions, scraping down bowl as needed. Give batter final stir by hand to make sure it’s fully combined. Scrape batter into prepared pan and smooth top. Gently tap on counter to release air bubbles. Bake until skewer inserted in center of cake comes out with a few moist crumbs attached, 45 to 50 minutes. (Deep chocolate cakes like this one are very difficult to gauge and you do not want to overbake. If you have one, use an instant read thermometer to test the doneness and pull the cake around 205 degrees). Let cake cool in pan on wire rack for 10 minutes. Remove cake from pan and let cool completely, about 3 hours. Dust cake with cocoa powder, if desired, and serve. 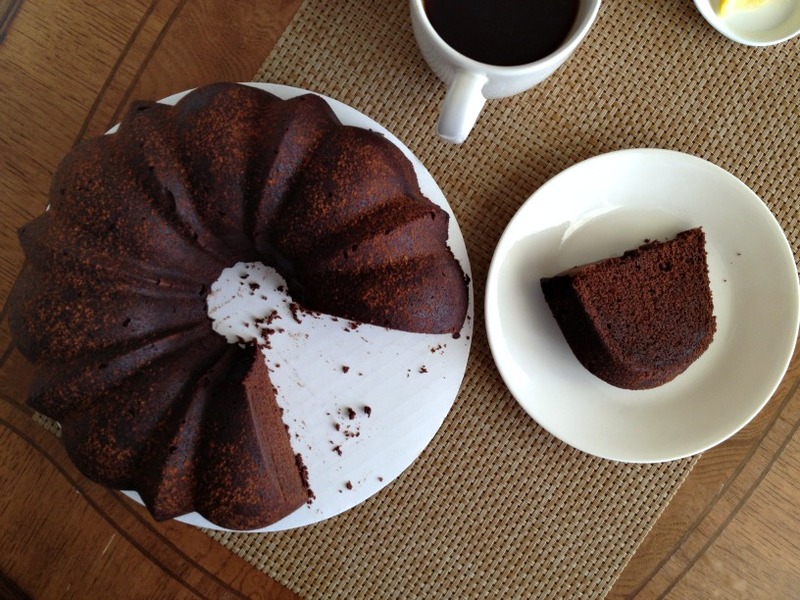 This cake looks incredibly beautiful – rich and moist and chocolaty which I imagine the Earl Grey just brings to life. Life can be so difficult sometimes, but at least you can take some comfort from a beautiful cake. Thanks, Kate. I can always count on a day in the kitchen to calm the spirit. 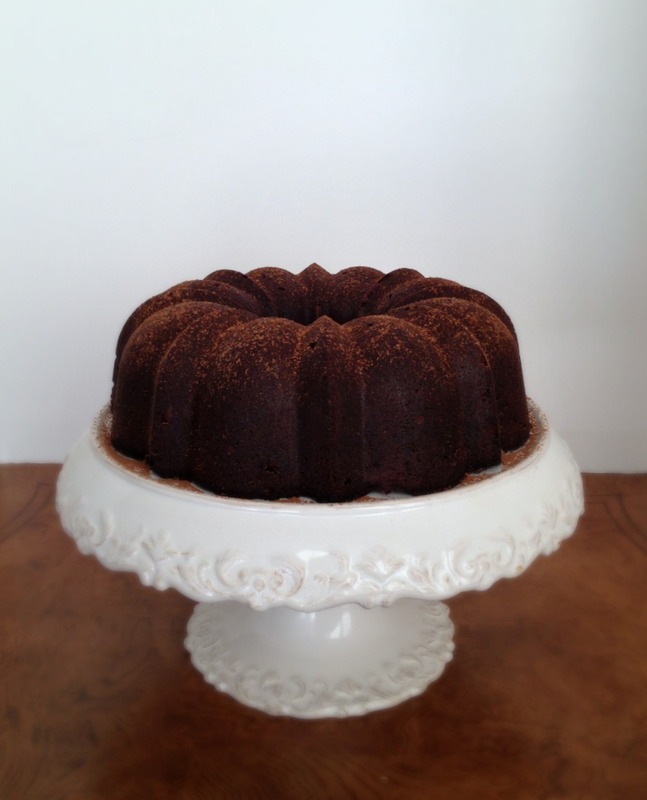 A Bundt can certainly make any simple cake look better! You write beautifully, I must try the cake, and I am extremely envious of your cake stand. All of this post is lovely! Oh, I need to make this. I hear you about trying to find this new normal. I’ve been on the edge for days, unable to shake this awful somber feeling. Today I burst into tears (almost in public, but managed to escape the building first…) after of all things, Sportello running out of everything bagels. I haven’t had one for seven weeks, and walked in to see two left, which, upon asking for one, I was told they “had been spoken for”. It was a trivial, silly thing, but another sign that the universe is conspiring against me – aside from last week, there was a shooting down the block at work on Tuesday. When will it become quiet and boring again? It’s been a long, long week. This is a lovely post. I hear you. I’ve been very touchy and moody lately. I’ve had my own “bagels” that have set me off. Though I am starting to feel better this week. On another note: You must be coming out of a gym challenge. Seven weeks–impressive! I’m always ambivalent about chocolate (I know, it’s strange). But with Earl Grey? Oh, my goodness! I do love rich, deep, dark chocolate, but I cannot profess to being a chocoholic. I am a teaoholic (? ), though, so this works! So you really made a Bundt cake.. after all we’ve been through with that other cake that shall not be named?! :) I would so much rather have this… and am really wondering why leftovers never make it to work. Hmmm… Earl Grey is one of my favorite teas and you know me and chocolate. This just landed on my must-make list. I do love a good earl grey and how fabulous to pair it with a nice, deep chocolate cake. things still seem a little off, but trying to figure out a new normal! I’m really digging tea/chocolate combos. And I’m feeling a bit better everyday and happy to be part of the Boston community.